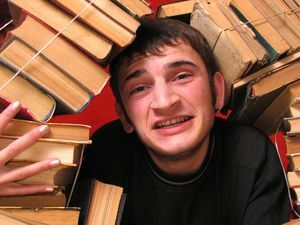 Why are students still having to bother with books? What year are we living in? Are they also riding to their classes on horseback and getting into duels? Here's a bonus tip for students: If one of the books on the required reading list was written by your professor, save your money, because you're going to hear ALL about it in lecture. There's also some good websites where you can rent textbooks for a fraction of the buying cost. Sites like Chegg.com has had every book I've needed for school; they send it to you, you can print out a return label at the end of the term and they plant a tree in your honor. Aw. Or: the students could learn about BitTorrent, eMule and their ilk. Thanks lisa- I've heard about these textbook rental services, and they seem like a great idea. My understanding was that the general business model was to rent at around 50% of the new-book price, which doesn't seem like such a great deal to me. But maybe some are better than that- definitely something to consider. You can also try Abebooks.com I once got a book from them at less than half the cost of my school's price.